Social media is probably the best thing that has happened to businesses of all shapes and sizes. The viral nature of social media, along with the possibility of community and relationship building is an awesome deal that no business can afford to ignore. E-commerce stores that specialize in apparel are no exception. You already know that many women are passionate shoppers and, apart from Facebook, Twitter, and LinkedIn, the social media network that they frequent the most is…Pinterest! According to Craig Smith of Expanded Ramblings, more than 80% of all Pinterest users are women. Pinterest is growing at an astounding rate. With more than 70 million users and 2.5 billion page views, Pinterest is one of the fastest growing social networks today. It saw a whopping 125% growth in international traffic in the year 2013 alone. So, why is it the perfect answer for your apparel business? Sarah Mincher posted an infographic on Social Media Today, which reveals that Pinterest is now the 3rd most popular of all social networks. It gained its first 10 million users faster than any network. Shoppers who are referred to a site from Pinterest are 10% more likely to buy. On average, Pinterest referrals spend 70% more than visitors from non-social channels. Call-to-action pins, on average, pump up engagement by an incredible 80%. The average order amount placed through Pinterest is about $80 and the average household income of a Pinterest user is $100,000. Clearly, it makes business sense to be on Pinterest. Given the visual nature of the medium along with the fact that most users on Pinterest are shoppers (or at least they have a tendency to shop more), it makes sense for your online apparel store to have a sustainable and growing presence on Pinterest. Plug in the combined power of other social networks like Facebook and Twitter, and you have a lot going for you. Make sure that your visuals are professional. Include real (and professionally rendered) photos for your products. Include photos of real people – click pictures of your team, office and work life in general. Bridge other social networks like Facebook and Twitter along with your Pinterest for maximum returns on your efforts. Leave comments on other boards. Engage with others on Pinterest. Ask questions. Build real relationships. Leave a social footprint on Pinterest by visiting, liking, sharing, and pinning. Have conversations. It’s called “social media” for a good reason. Curate content that’ll be of value or interest to your followers on Pinterest. The more populated and engaging your boards are, the more followers you’ll gain. Say goodbye to cheesy model photos when it comes to your business. Real buyers with purchased apparel from your store make a lot more impact. Potential customers get to see how the clothes you sell actually look on real people. This helps them to make better buying decisions, which is actually good for you. “Buy” buttons allow for immediate purchase or at least direct links to product pages. Pinterest is a social network. If they aren’t buying, they are sharing. What would you pay for engaging shares? Newsletters are an inseparable part of your online business. Digressing a little from the world of apparel, Unbounce, Mailchimp, and Campaign Monitor have some great pins showing the effectiveness of newsletter and landing page optimization. There are innumerable companies, large and small, that have used Pinterest to create a community around respective brands, products, and services. Each of these brands is an open board for the whole world to see. Since Pinterest is visual and it allows for social traction, your own boards with pins make for a great and easy way for your customers to “check you out.” If nothing, you’ll at least succeed in building a passionate community around “fashion” or another niche your apparel fills. Hannah Clark of Social Media Today has yet another list of five businesses that are nailing it on Pinterest. Can we take a few lessons from there? Pinterest works almost like your e-commerce store, if you think about it. Your pins can include a call-to-action, and emulate just about everything the product pages on your site can do! You could balance your pinning and repinning while including rich pins on your site. Rich pins, such as article pins, can also help you with your content marketing strategy. Each of your product images can have product descriptions that you can optimize for SEO. Working as a parallel and social channel for your apparel store, Pinterest falls straight into your marketing plan. What social networks are you predominantly on? Do you have Pinterest as a part of your social marketing strategy? What do you do with it that makes a difference to your apparel business? The post Pinterest May Be The Perfect Answer For Marketing Your Apparel Business appeared first on Small Business Trends. You’ve most likely heard the old adage, “A picture is worth a thousand words” and it appears that Twitter would agree. It is now possible to tag multiple photos in a single tweet. Twitter 6.3, the upgraded version of Twitter, brings multiple features which are expected to make use of the site more engaging. The most interesting among them is the ability to tag multiple photos in one tweet. 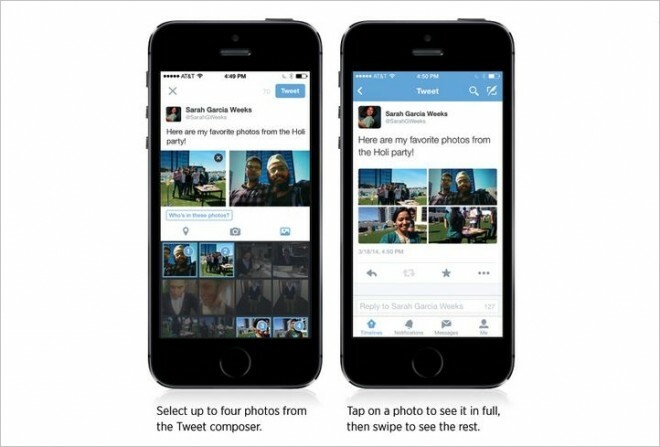 Twitter now allows users as many as four images in a single tweet and up to ten people tagged. The thumbnails of the photos you are planning to upload will appear in the Tweet composer. To see these photos full screen, simply tap them. You can also swipe each of them to move to the next image. The four images will appear in collage form in your tweet. The limit anyone can use to express his or her thoughts on Twitter is 140 characters. So will the images take up some of the character space permitted? No, images are not counted under the characters so users can add images and, at the same time, express their thoughts in 140 characters. Not only can you easily tag individuals in photos, as displayed below, but you can just as easily remove them. Just tap on the image to get a detailed view of the tweet. An ellipsis sign occurs at the end of the tweet and you can click on it to see the “Remove tag” option. 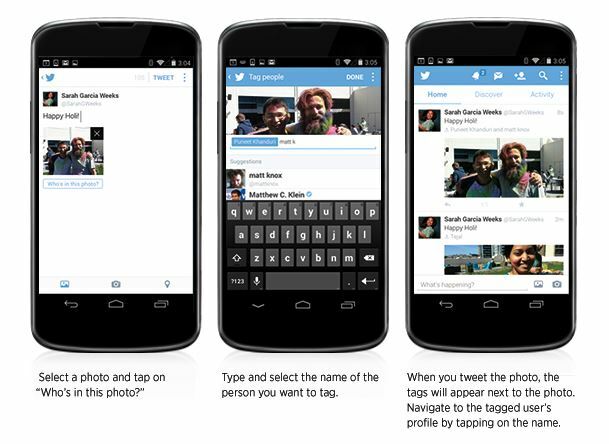 Users have the option to monitor Twitter tagging in images. You can visit the security settings of Twitter and set up who can and cannot tag you in a photo. You can selectively view and choose existing tags to determine the ones you want to keep and the ones you want to remove. Allowing more images in tweets takes Twitter a step closer towards becoming even more social. But the question remains: With the increasing changes, has Twitter’s metamorphosis towards becoming another Facebook already started? The post Transforming Twitter With More Images Means More Social appeared first on Small Business Trends. Economically speaking, the news concerning Michigan typically focuses on the purported death of Detroit. To counter that negative trend, the Michigan Economic Development Corporation (MEDC) is hoping to spearhead some new growth among high-tech startups. The Michigan Pre-Seed Fund 2.0 is actually a continuation of a previous effort. It will provide $6.8 million. That’s $5.8 million to high-tech startups in the state and another $1 million to help universities transfer technology to the marketplace. A previous Pre-Seed Fund invested $20 million in 90 firms beginning in 2007. The money to fund Pre-Seed Fund 2.0 comes from the public sector. The initiative is being managed by a private firm called Invest Michigan. Invest Michigan President and CEO Charlie Moret says his company’s goal is to learn lessons from the first version of Michigan’s Pre-Seed Fund and make smart investments. Invest Michigan hopes to find tech startups in some of the following areas: advanced automotive, manufacturing and materials, agricultural technology, alternative energy, homeland security, information technology, and life sciences. New funding will become available in May first for companies that missed their chance to apply for the previous Pre-Seed Fund. Then the funding will be open to applications from new tech startups by June. Moret says companies applying for potential seed money from the fund will hear their fate within 45 days. The post Michigan Creates $6.8 Million Fund for Tech Startups appeared first on Small Business Trends. You are currently browsing the Business, finances, forex blog archives for April, 2014.